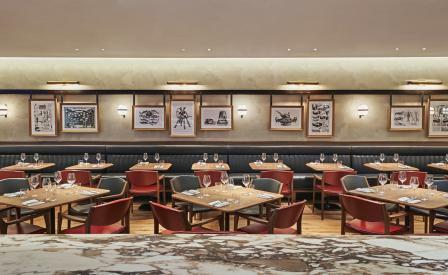 Gridiron by Como, a live-fire grill restaurant, has opened at Como Metropolitan London on Park Lane. When the hotel debuted as The Metropolitan in 1997 it was crowned the capital’s first hip hotel and heralded the arrival of the ‘lobby living’ and ‘mixology’ – concepts already causing a stir in Manhattan. Part of this high-octane formula included a destination restaurant – the first Nobu to open in the capital – and the paparazzi-magnet members-by-invitation-only Met Bar. Well, now the latter has gone forever. Once the late night playground of creative ‘shakers and movers’ (to coin a late-1990s phrase), it was part of the hedonistic Britpop landscape which prompted Vanity Fair to declare ‘London swings again!’. But the Met Bar lost its cool around the turn of the millennium, although it continued to operate as a hotel bar. But now the space has been revived with the arrival of Gridiron by Como, a collaboration between Como-owner Christina Ong and British chef Richard H. Turner, executive chef of Hawksmoor and one half of independent butchers Turner & George. Gone is the DJ booth, the red pyrolave-topped bar, and the snaking curve of red leather booth banquettes. The 62-cover restaurant is more spacious by comparison, and lighter, benefitting from an earlier renovation that opened up the old cloakroom, creating a bar seating area with windows overlooking Park Lane. Most impressive, is the addition of the exposed grill to allow for open-flame cooking in the open kitchen, which involved considerable work to install the necessary extraction units behind the scenes. Front of house, red leather still figures on Porada dining chairs and bar stools, but its paired with a more sobering dark green leather upholstery. Now more modern British brasserie, than moody late night boîte, interior designers Macaulay Sinclair have matured the space with dark woods, richly veined calcutta rosso marble and brass detailing. Lighting is particularly elegant, created by one of Ong’s favourite firms, the Paris-based L’Observatoire International. Black and white etchings of food and gridiron tools on the walls pay homage to the modern British menu which specialises in fire-cooked dishes. Starters range from crisy fried squid to pig’s head and black pudding croquettes. For mains there are numerous chops and steaks for meat lovers, their provenance clearly stated (natch) – Barnsley hogget, Shorthorn onglet, Dexter prime rib. However, fish options are equally hearty with the Dover sole meunière, brown butter and capers a standout, matched well witht the creamed spinach or the glazed grilled carrots. For those wanting to raise a glass to the good old days, cocktails by Max and Noel Venning, of Dalston’s Three Sheets, are a good match to the libations of the bar’s past. Revamped classics include a clarified White Russian and mustardy Bloody Mary. The Gridiron signature, with echoes of a Met Bar Whisky Sour, comes recommended.